I wasn't born in Ashburton, nor have I ever lived there. I first visited in 2002 while on a Family History Hunt, and I've been back more than seven times. There is just something about Ashburton...not just my family connections, but the town itself. It was my 3rd great grand uncle who once lived in Ashburton. He was the Rev John Ward Lay, born in 1804 and the second child of eight to John Lay Esq. and his wife Mary née Ward, of Crepping Hall in Wakes Colne, Essex. John Ward Lay (JWL) attended St. John's College, Cambridge from 1822 until his graduation in 1827, when he was ordained a member of the Anglican clergy. He was given the curacy of St Andrews, Colne Engaine in Essex where the incumbent minister was the Rev. Greenwood. Reverend Greenwood had a young daughter Caroline, and at some stage romance blossomed - Caroline was later to become JWL's wife. In 1836 JWL was given his own parish, that of St Peter's in Roydon, Essex, and in 1839 he and Caroline were married in her father's church in Colne Engaine. For very personal reasons, in 1843 JWL made the monumental decision to leave the ministry, move to Devon and become a gentleman farmer. He and his wife Caroline were living on Tor Hill in Kingskerswell where they had a small orchard and JWL was honing his farming skills. It was here that their first child, a daughter named Caroline (called Carry) was born in 1849. Marian, (called Minnie) was born in Hele House in February 1854, and Walter was born there in October 1856. A year later, in December 1857, JWL's wife Caroline tragically died aged just 37. Her death was followed by that of her infant son Walter in March 1858 - he was aged 17 months. I have many old family letter and JWL has always come across in these as a strong and rather stoic chap, but in one letter he wrote to his niece (my 2nd great grandmother) in 1867 he says: 'The loss of my dear little boy at the engaging age of 17 mnths was a very great trial to me.' Very telling words from the usually stiff-upper-lip Reverend Lay. JWL soldiered on with his two little girls and staff at Hele House, and thankfully wrote many long newsy letters to his brother, sisters and niece, and I am very lucky to have copies of many of these. They tell a wonderful story of the happy life they led in Hele House and Ashburton. JWL's sister Louisa Emily Page (nee Lay) had been widowed after only four years of marriage to the Rev. Robert Leman Page. She lived in East Anglia and ofter took her two small children Robert Lay Page and Emily Leman Page to stay with her brother and his little girls in Hele House. JWL was a kind of surrogate father to his Page nephew and niece Robert and Emily, and his daughters Carry and Minnie came to regard their Aunt Louisa as their second mother. 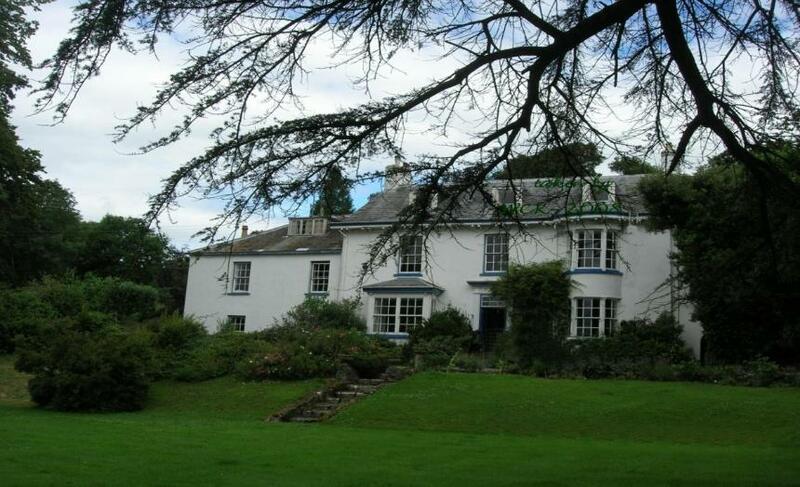 The Page children developed a love of Hele House and Ashburton which lasted all their lives. Emily painted several watercolours of HeleHouse, which she deemed important enough to be bequests in her will. When she married, she chose St. Andrew's Church for the event. There, on the 22nd January 1867 she and Captain George Johnson R.N. tied the knot with Emily's brother, now the Rev. Robert Lay Page, officiating. Above: The author's own photograph. Ashburton residents had happily accepted JWL and his family and he developed especially close friendships with the Sawdyes and Tuckers. His signature is on display on the Sawdye's large Golden Anniversary poster in Ashburton Museum (last signature, 1st column). Dear 'Old Beer' and his wife Susan worked for JWL from about 1853 until the early 1870's. They had become thought of as members of the family and their names come up in several old letters written by the Lay children to their uncle JWL. In 1881 JWL decided that he was finally getting a bit too old to continue farming and orcharding (and falling out of trees and off his horses etc.) and so reluctantly put Hele House on the market in December 1881. He bought the house that later became No. 62 East Street, Ashburton, and he and his daughters Carry and Minnie moved in. Above: 62 East Street (the last one before the property painted green). JWL was keen to develop his daughters' talents. In 1860 JWL wrote to his brother Mark: 'I am endeavouring to give my two little girls a good education... Carry is at least reputed clever, she knows a little French. Minnie has commenced Italian, is a very fair arithmetician, and can make herself a petticoat with a little help. Moreover she will canter the pony about sidesaddle or astride as well as a boy. Eight years later he was to write to his niece Ellen in Australia:' I am quite rejoiced that you have been giving your children the best education in your power; you will be sure to be repaid for it. 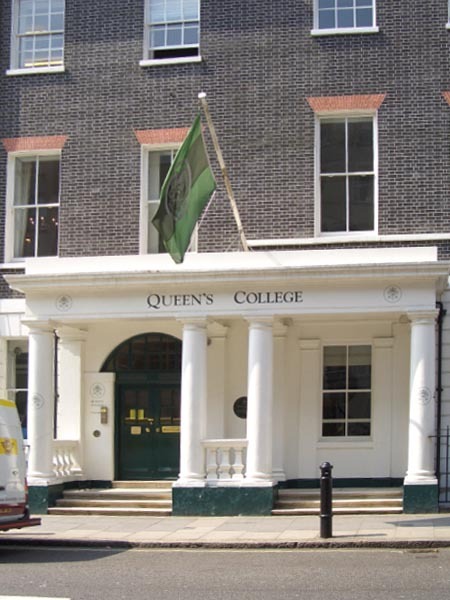 Carry is now finishing her education at Queen's College, Harley Street, London. She lodges with the same lady (Mrs Bovell) as Mrs Johnson did when she was there. Both girls attended Queen's College in Harley Street.' Caroline Lay appears in the records from lent term 1868 (Jan-March); in the I Seniors to Easter term 1869 (April-June) and in the II Seniors as a Compounder, which means that she took the full course of subjects: Arithmetic, Drawing, English, French, Geography, Geometry, German, Ancient and Modern History, Italian, Vocal Music and Instrumental Music. In the lent term 1869 (Jan-March) she stopped taking Geography and in the Easter term (April-June) stopped English, German and Ancient and Modern History. Marian Lay appears in the records from the Michaelmas term 1870 (Oct-Dec); in the I Seniors also as a Compounder to Michaelmas term 1871 in the II Seniors. In addition to the full set of subjects she also took Latin, Natural Philosophy and Theology, but did not take English until the Michaelmas term of 1871. 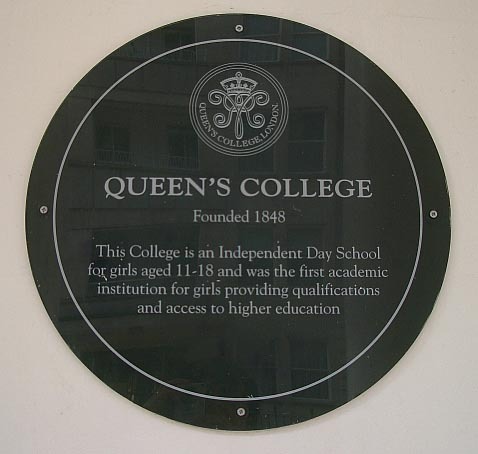 Founded in 1848, Queen's was the first higher education college for women. Additional information from Ms Lucy Bailes, archivist. Many thanks to http://www.victorianweb.org/art/architecture/london/110d.html for the images in this section. Caroline gained her BA at London University which in 1878 had become the first university in the UK to admit women to its degrees. 4 women passed its BA degree in 1880, and in 1881 2 women gained a BSc. Caroline obtained her BA in 1885. By 1895 over 10% of its graduates were women. In 1886 Carry established a High School for girls* and in 1889 Minnie married the Grammar School headmaster, widower James Mortimer. 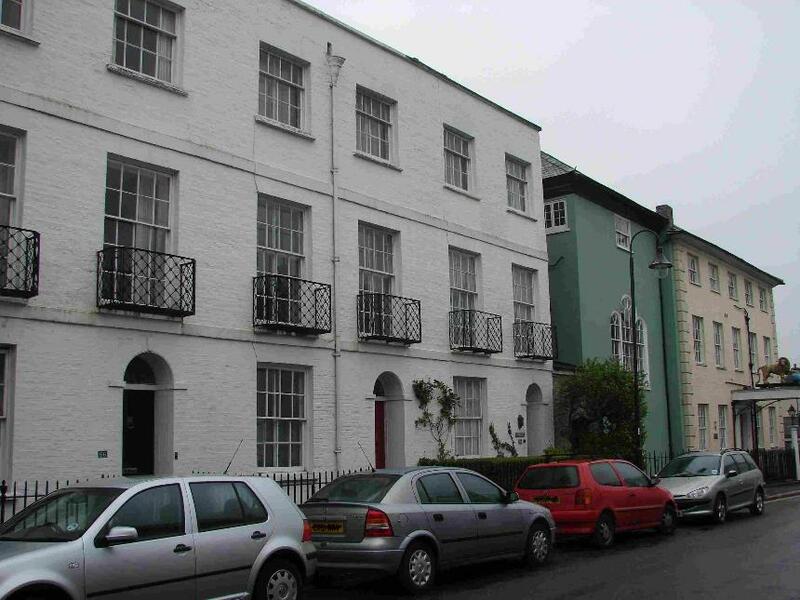 Both women were to become well-known and respected residents of Ashburton where they lived to the end of their days. *See More Ashburton Schools on this website. Uncle JWL died, aged 88, on November 9th 1892. There was a very nice obituary in the Exeter Flying Post on the !2th: 'The Rev John Ward Lay M.A. of Hele House*, Ashburton, a respected and prominent inhabitant of the town, died on Wednesday in his 88th year.' At his request he was buried in St Peter's graveyard, Buckland in the Moor, in the family vault with his late wife and little son. Minnie died aged 74 on June 30th 1928, and was buried on July 3rd in Ashburton graveyard. She was joined by her husband James Mortimer (aged 83) in March 1929. Their son Hugh married in 1932 (to the granddaughter of the authoress Mary Elizabeth Braddon, whose most famous book was Lady Audley's Secret!) Their daughter Grace never married and moved in with her aunt Carry after her father's death. Carry died at the grand old age of 92 on June 12th 1941 and was buried on June 16th beside her sister and brother-in-law in the graveyard of St Andrew's. Her niece and nephew Grace and Hugh Mortimer erected a memorial for her. 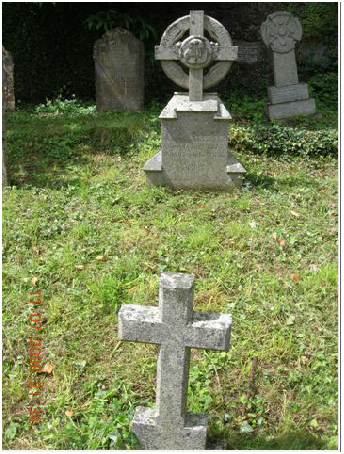 I located these graves in 2008 and after clearing them of layers and layers of weeds and grass, I found two very beautifully restored graves underneath. 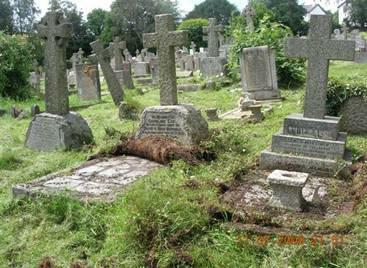 I have since learned that JWL's great granddaughter, who used to visit the family in Ashburton as a little child, had arranged for the restoration of the graves. Such is the enduring attachment of the Lay family to Ashburton. Above left: Minnie and James on left, Carry on right. 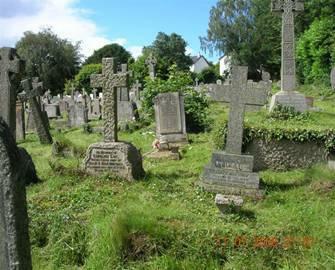 Above right: The same graves after a good few hours of elbow grease. Grace Mortimer inherited 62, East Street from her Aunt Carry. 'Miss Caroline Lay, of 62, East Street, Ashburton, left estate of gross value of £3411, with net personality £3017. Probate is granted to her niece, Miss Grace Mortimer, of the same address.' (Western Morning News 31 October 1941 p4 col4). When she died in 1975, the last link to Ashburton passed from the family. I still nod at its front door - and Ireland House - as I walk past, on my way to Café Green Ginger for afternoon tea! After that I head down to the graveyard to do some tidying and leave some flowers. I have such fond memories of Ashburton - and I have mementos from its quaint shops all over my house. I will be back again - and again. Though I live over 10,000 miles away from Ashburton, it is never far from my thoughts. Very many thanks to Wendy for this contribution.